This was initially going to be a comprehensive ranking of the games however due to the fact I’m not as familiar I am with these games as I would like for a ranking I doubted I could have done the franchise justice. Instead as I’ve noticed during the comments of most posts regarding Shin Megami Tensei IV: Final the franchise due to its size and complexity seems to raise a lot of question. As such the goal of this article will to be to familiarize people with this strange behemoth that is Shin Megami Tensei. What is it? I thought I’d start out with what is this series and why is it popular and unique. Other then the other great RPG franchises of Japan such as Tales of..., Dragon Quest, and Final Fantasy, Shin Megami Tensei is modern and less fantastic. Although dealing with gods, angels, and the Devil himself (Lucifer actually is an awesome character when he appears) MegaTen is rooted in reality. Often you’ll find yourself playing in areas that exist in real life, or could have if this calamity happened. Furthermore the concept of good and evil doesn’t really exist, instead it relies on the more complex and less judgmental ideas of Order and Chaos where its up to the players to choose through their actions which side they will end up with, each side always having having ups and downs (their is also Neutral routes). Interesting and rather uniquely neither side fully conforms to the western conceptions of good and evil, as I said Lucifer himself is a charming and interesting guy who often speaks to how I personally would see the world as chaos and freedom are intrinsically linked (and who doesn’t like freedom) while Order often linked with the Angelic Orders are often synonymous with control and oppression. In short these games don’t give you a choice on good or bad they let you choose often how the world should work and merely let the consequences of those actions happen. 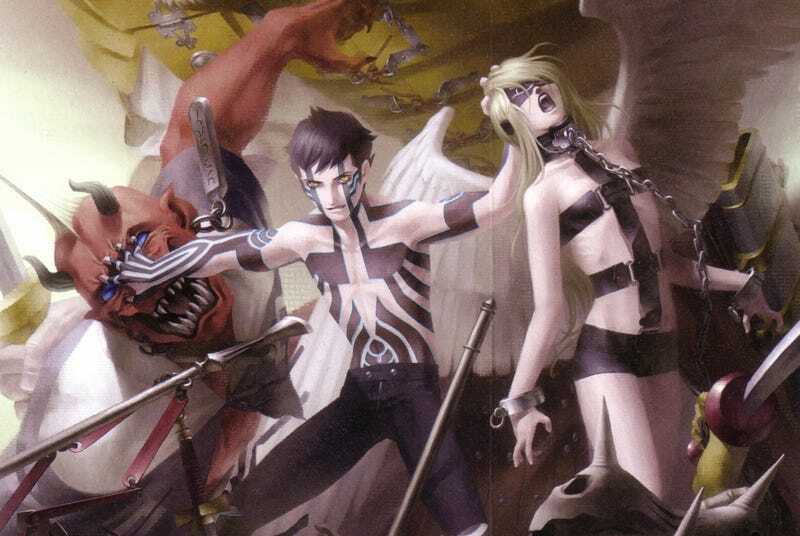 Digital Devil Story: Megami Tensei: Kinda like Metal Gear Solid had Metal Gear before it struck its serious popularity, Shin Megami Tensei had Megami Tensei. Based on a Japanese novel of the same name this franchise by Atlus had two entries on the Famicon, released only in Japan for Westerners they are little more then historical curiosities. In terms of this guide other then being the historical root of the games and the source of the nickname for the series MegaTen they have no bearing on the series now what so ever. Shin Megami Tensei: This right here is the real beginning of our story. Originally released for the SNES Shin Megami Tensei (True Godesses’ Restoration for those wondering) marks the first title a Westerner would recognize. Indeed the general format of the game and battle system have not changed much through all its sequels now nearly a quarter of a century later. It’s numbered sequels would go on to provide the backbone of the franchise and the majority of the games thematic motifs are introduced through the main series. For beginners to the franchise this series is always the one I’d say gamers should try first as everything else comes from it, furthermore I’d argue Shin Megami Tensei: Nocturne (III) is probably the single best game in the series at the current moment. If one can navigate Nocturne the entire universe of Shin Megami Tensei is open to you and as a gamer you are better for it. Furthermore unlike other franchises although tangentially linked each game in the series is unrelated to each other meaning you can pick up any game you want and enjoy it as any other. Entries: Shin Megami Tensei (SNES), Shin Megami Tensei: If... (SNES) Shin Megami Tensei II (PSX/SNES), Shin Megami Tensei: Nocturne (PS2/PSN), Shin Megami Tensei: Strange Journey (DS), Shin Megami Tensei IV (3DS), and Shin Megami Tensei IV: Final (3DS Unreleased). Persona: This is next on the list due to its widespread popularity. However as it stands now its connection to the MegaTen series is very loose as Atlus has increasingly made Persona its own thing, which to many fans of the franchise is a good thing. Dropping of the Shin Megami Tensei label starting with Persona 4 Golden in my opinion was not a coincidence instead it was merely the beginning of a long term unraveling that will allow Atlus to alter the direction of Persona without alienating long term MegaTen fans. That being said it’s probably the single most important sub series right now for getting people familiar with MegaTen. It’s unfortunately also the worst candidate for people to try if you want to get them into the franchise as a whole; because what makes Persona so unique and compelling is completely absent from MegaTen as a whole. If people go in expecting a Persona type experience in the main series for example they will be disappointed. This is not to speak ill of Persona its in fact one of my favorite franchises it just shows how different it is especially with its non-RPG spin offs being so popular. This is in a nut shell creating a rift within the fanbase that I do not see being mended anytime soon, the reaction to the SMTxFire Emblem trailer by MegaTen fans is instructive to this. Basically for newcomers to the entire franchise Persona should be seen as its own side excursion especially starting with Persona 3 which is very different from its predecessors. This is because the first two less popular games were more in line with regular MegaTen mechanics and themes. Basically what I’m trying to get to here is Persona is amazing as its own entity but its place within the MegaTen fold is unsure. Again like most entries in the franchise each are not directly connected to each other but references long time players will enjoy are present. Shin Megami Tensei: Digital Devil Saga: Digital Devil Saga I and II have to be seen as a single game and therefore not really a sub-series like the rest. Unlike most other series within MegaTen which do not have much connections to each other, Digital Devil Saga 2 is a direct continuation of the first entry making starting with the first game paramount. As such this makes DDS as one of the harder entry points for new players. just due to the sheer amount of gameplay one must get through, as these are some of the largest games in the franchise. However if somebody does brave the daunting task they will find some of the best games in the entire franchise. Running on the same engine and using the same battle system as Nocturne, DDS is superficially similar to fans however its unique take on the franchise is well regarded. You see unlike the more modern settings of Shin Megami Tensei games DDS takes place in a Sci-Fi end of world scenario, furthering its differences unlike other games that take inspiration from the Judaeo-Christian mythos DDS is very much an eastern game influenced by the religions of India and Asia most notably Buddhism. This makes the games very unique and perfectly stand alone. Indeed personally they’re my favorite entries in the series. Devil Summoner: Unfortunately I’m going to have to plead ignorance here as I’ve only actually played half this series. You see Devil Summoner is kinda unique as its actually basically two sub-series under the same branding; the first entry in the series is actually one of the first spin off games in the entire franchise it being simply titled Shin Megami Tensei: Devil Summoner and its follow up Devil Summoner: Soul Hackers. Both games play more like your traditional Shin Megami Tensei games with a nameless protagonist going through the story in this case solving crimes. The last two entries in the series are a radical departure from all of this. Devil Summoner: Raidou Kuzunoha vs. The Soulless Army and Devil Summoner 2: Raidou Kuzunoha vs. King Abaddon as the name would suggest are directly related to each other and I believe the first named protagonist in this case Raidou Kuzunoha the XIV (not including anime tie ins) an heir to a demon summoning clan who solves mysteries. Beyond this these titles abandon the classic turn based battle system that you find in all other games for an Action RPG combat mechanic. This makes both games very much unique. Unfortunately previous to its release on the PSN last year very few people in the West had a chance to play these games due to the two later entries being released in 2007/08 well into the PS2’s lifecycle. Further issues included the fact that that the games only received limited releases due to the increasing popularity of the PS3 at the time. This being said despite now being easily accessible via the PSN this series is most likely the last series I’d ever recommend somebody new to the series to play, especially The Soulless Army. Devil Survivor: The latest of the spin off sub-series Devil Survivor is also probably one of my favorites. Another departure from the turn based fare of SMT proper Devil Survivor is a tactical RPG more akin to Final Fantasy: Tactics or Fire Emblem then other entries in the series. Taking place in modern day Japan each game features on a group of young teenagers trying to fight against an invasion of some kind with the main protagonist being a figure that will determine the fate of the world. Although the story is kinda cliched and far weaker then almost every other game the Battle System more then makes up for it being a very competent tactical RPG. That being said unlike other entries in the franchise these games lack the signature difficulty (much like Persona) that makes MegaTen so engrossing, they instead rely more on a quick plot with various turns to keep people interested and moving forward. The Demon fusion mechanic another staple of the series is also very much simplified especially compared to SMT itself and even Persona. That being said it’s an excellent entry point as the feel of the games is unmistakably MegaTen especially the first game where the pull of order, chaos, freedom, and control is really well done. Actually to be honest this series provided my first MegaTen game with Devil Survivor: Overclocked when the 3DS was lacking in quality RPGs (yes there was a time like that). I know there are better games to start off with but if you’re scared of that notorious Atlus challenge there are worst entry points then Devil Survivor. Entries: Shin Megami Tensei: Devil Survivor (DS), Shin Megami Tensei: Devil Survivor 2 (DS), Shin Megami Tensei: Devil Survivor Overclocked (3DS), and Shin Shin Megami Tensei: Devil Survivor Record Breaker (3DS). Conclusions: Well that is everything I can think of a beginner would need to know about Shin Megami Tensei if they’re interested and want to dive in deep into the franchise. I know I am missing some spin off games, anime, and movies but as the franchise is so deep it’s really hard to keep them all straight. Really right now we in North America are in a golden age for JRPGs (kinda funny how we were talking about their death not three years prior) and Shin Megami Tensei is one of its brightest lights. It’s about time North America finally gets to see all these games and perhaps with Persona leading the way Shin Megami Tensei will get its place in the light. As always thank you for reading, leave your comments as I love reading them, thanks.